...that Project Rebirth was an effort to revitalize the city of New Mombasa after the Covenant War? ...that the Oort cloud of the Epsilon Eridani system contains Forerunner artifacts? Hunting Party is one of several stories in Halo: Tales from Slipspace. Written by Jonathan Goff and drawn by Simon Roy, it follows an assassination attempt of the Jiralhanae warlord Atriox by the Sangheili Special Operations unit, the Silent Shadow. The Great Schism instigated a deep-seated feud between both the Sangheili the Jiralhanae races. 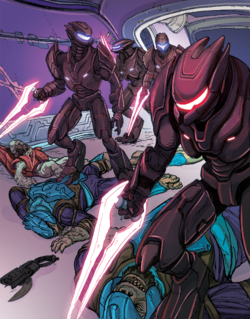 While many Sangheili over time would put aside this strife to take up new causes, others were not as willing to forgive and forget the transgressions of the past. Among those devoted to the pursuit of vengeance against the Jiralhanae was First Blade officer Resa 'Azavayl of the Silent Shadow. In the wake of the war, Resa 'Azavayl ventures out to seek absolution by hunting down treacherous Jiralhanae and any found associating with them. He successfully leads his fellow Silent Shadow commandos on an exhaustive campaign to wipe out Jiralhanae forces across multiple star systems. He and his warriors manage to slaughter their former allies at an armory on the fourth moon of Victors' Truth, aboard the stolen Covenant corvette Adherent, at the northern highlands of Thalia, aboard a derelict colonial substation orbiting Sansar, and eradicate the last remaining members of Chieftain Tartarus' crew aboard the Covenant cruiser Rapid Conversion. While on a mission to massacre more Jiralhanae, 'Azavayl and his squad infiltrate the SDV-class heavy corvette Elegy's Lament. Unbeknownst to them, Elegy's Lament is crewed by Jiralhanae of the Banished and commanded by the faction's leader, Atriox. The Silent Shadow manage to stealthily kill some Jiralhanae before an alarm is triggered and Atriox is alerted of their hostile presence. Despite being cloaked, Atriox notices the assassins' scents when they enter onto the bridge of the ship. He invites the would-be assassins to show themselves and then proceeds to question Azavayl's blind adherence to honor and vengeance. 'Azavayl reveals his intention to kill Atriox, the betrayer, to avenge those whose lives were taken by Atriox long ago in the Covenant. Atriox states that the Banished are different from those who had previously mislead and betrayed the Sangheili in the Covenant, and affirms that he is not 'Azavayl's enemy. Preferring not to fight the Silent Shadow, Atriox instead extends 'Azavayl and his warriors an offer to join the ranks of the Banished. Unamused by Atriox's words, 'Azavayl declares that he and the Banished deserve death for their past sins. Resa's brothers in arms, however, feel their mission no longer holds purpose considering the changing state of the galaxy and wish to side with Atriox. Believing that 'Azavayl was blinded by old loyalties and festering delusions of vengeance, his subordinates turn on him and drive their energy swords into his chest. Impressed by their action, Atriox welcomes the Sangheili warriors to the fold, telling them he can grant them many things except honor, as it holds no weight beyond sentiment. A rough comic layout of the story.